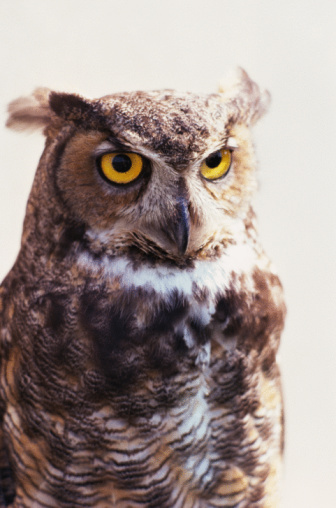 Fake owls might keep some pests away, at least for a while. Small birds and mammals such as young rabbits that are typically eaten by large owls instinctively recognize and avoid owl shapes. Unfortunately, these creatures quickly learn that an owl statue is not a threat at all and ignore it. Some birds may even gang up on the perceived predator and attack it as a group, which is counterproductive when trying to scare birds off the property. Rabbits are most likely to be scared of owl statues that resemble large owls native to the area. Most owls are too small to take adult rabbits, but the great horned owl is a threat to both juveniles and fully grown bunnies. Get down to a rabbit's eye level and choose several highly visible locations for the statue. Move the statue at least once a day until you've installed a rabbit-proof fence or other barrier around the garden or area you're aiming to protect. As with rabbits, pigeons may be intimidated by an owl statue for a few days, especially if you move it around. Position the fake owl close to but at a much higher level than the area you wish to protect. For example, to keep pigeons away from a car, place the statue on a roof overlooking the car. Crows are fast learners, so an owl statue is likely to work for an even shorter period on them than other creatures. A fake owl may work if you merely need to keep crows away from a garden for one day. Crows may mob the owl, but this keeps them away from plants or seeds while you install a more permanent barrier. Position the crow overlooking the garden or other area you wish to protect. Seagulls are too big to be intimidated by owls. They do view owls as a threat and may mob them, but an owl is unlikely to keep seagulls away for long, if at all. The only real solution to seagull problems is to ensure people don't feed them and that garbage is securely sealed in cans. An owl might make seagulls think twice about hanging around, but its main purpose will be decoration. A mechanical owl or a version that has wings that flap in the wind may be more effective. An owl might work well on small birds such as sparrows if you need to scare them away for a while. Fake owls may also scare squirrels. There are few other mammalian pests that owl statues would frighten. Most mammal pests are either too large to be prey for owls, have poor eyesight or are nocturnal and wouldn't see the statue. Mice might be the main food of many owls, for example, but a plastic statue will likely have no effect on them.